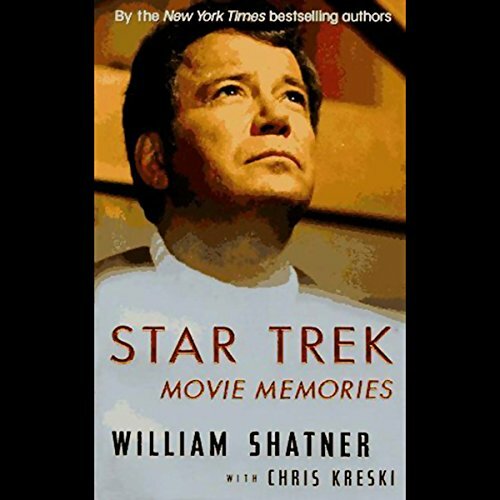 Star Trek Movie Memories recounts all the chaos, creative turmoil, backstage politics, power plays, and production nightmares that permeated every one of the six Star Trek movies, including the accumulated grudges that haven't yet mellowed with the passage of time. And the stories... Nicholas Meyer writing the script for Star Trek II in 12 days... Kirstie Alley doing her Leonard Nimoy imitation in an audition... How Kirk's love interest in Star Trek IV began as a role for Eddie Murphy... and you can imagine the rest (or maybe not). With stories and quotes from the principles that have never before been uttered in public, this will deliver a truly unprecedented behind-the-scenes view of the Trek films that will amaze even the most avid Trekker. ©1994 William Shatner (P)1994 HarperCollins Publishers, Inc. I bought this as a change of pace and it was definitely interesting, but I get the feeling that most of it is someone else's work, with Shatner adding a little color. 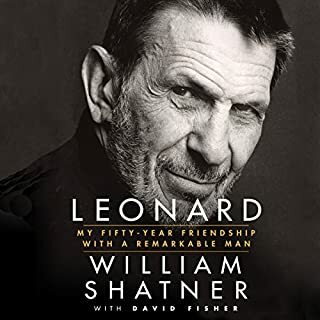 It's primarily a "production history", rather than a personal memoir, with rather few personal recollections, and very few recoutings of personal interactions between Shatner and those on set. If you're a Star Trek or movie fan, its interesting to hear about what it took to get the movies made - in the boardroom, on the set and elsewhere, but I think Shatner held back on some of the best material. 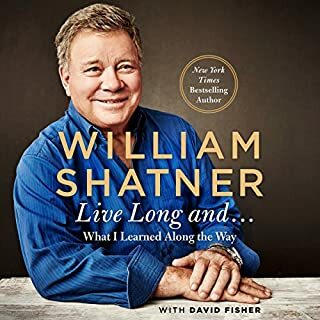 Shatner himself is surprisingly self-deprecating (given his reputation), and he reads along at a brisk pace. Its hard to tell sometimes if this is because the sound engineer upped the pace, Shatner himself wanted to keep the listener engaged, or if he was just knocking it out as quickly as he could. Nevertheless, a pretty good listen. I can't help but to listen to Star Trek Memories now to see if the lack of personal recollection here is made up for there. I think Bill needed a little quick cash. There really isn't a lot of "good stuff" revealed, and it comes across as a hastily prepared narrative that outlines the step by step occurances that took place over a period of years. No "insider stuff" here. Shatner being Shatner though, his fabulous ego that we all have grown to love shines through like a beacon in the fog. I enjoyed it, probably way more than I should have to be honest. There's still a lot of great stuff and stories in there about our beloved Star Trek. The worst part of it was that Shatner spends a seemingly endless amount of time talking about his gawd-awful Star Trek V movie "Final Frontier". Ewww that movie stunk, and he doesn't seem to acknowledge that. 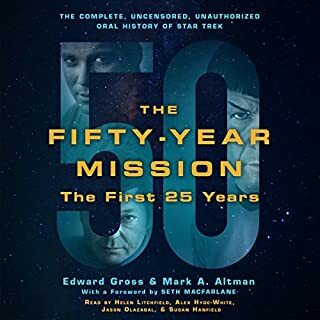 Anyway, if you want to read/hear about the making of possibly the all-time worst Star Trek movie, and a lot of other stuff, this is your book. A fascinating story about the casts experience and troubles during the filming of the original films. 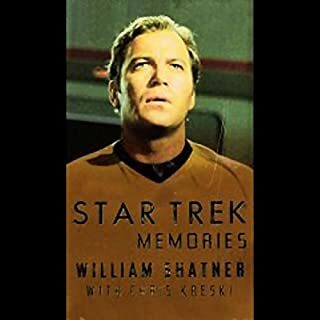 Great read by William Shatner (and author) and descriptive story telling for Trekkies like me. If you have been involved with the Star Trek franchise for any length of time, you will have undoubtedly formed an opinion of William Shatner. If that opinion is a positive one, you will enjoy this offering. Surprisingly if one holds a less than stellar opinion of Shatner, you will probably enjoy this just as much! Hearing the stories from his perspective is valuable and entertaining. The interesting thing is how it all works together when you read the experiences of the others involved with Star Trek. They all whirl together to give one a fairly complete summary of the experiences of the cast and writers of this far reaching collection of stories. Read this one, and take in all the rest, I hope you will see how the entire picture formulates itself once they have all been experienced. Star Trek Shatner Memories.. Superb! This reading by Shatner is great! He grips you and takes you along on a very well detailed ride thru Star Trek as well as thru the mind of Bill.. Get to know him and learn all you want to learn about Kirk amd crew! Loved every story and word. As the book inched closer and closer to the end, I just felt sad and wanting more. Again, I would like to thank Bill for sharing all of these stories and insights to his life. Brilliant and insightful, this monologue takes you on a journey with a welcomed frankness that only comes from one who lived through it. Plenty of facts of great interest to those trekkers and budding directors alike! 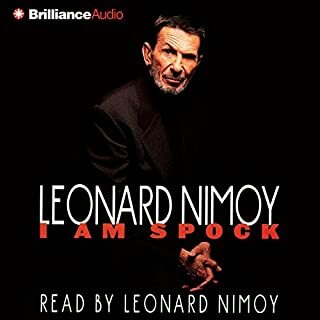 You would definitely listen to it more than once, and it's the perfect companion to his Star Trek Memories book as well. Time just flies!!! Good book, good performance, although rushed. What did you love best about Star Trek Movie Memories? What was one of the most memorable moments of Star Trek Movie Memories? Shatner's recollection of working on Star Trek V.
What about William Shatner’s performance did you like? I like Shatner's voice, and in general I really like his narrations. The Shat Is In The Details. Shatner's narration of his autobiography "Up Till Now" is a lot more lively and interesting. 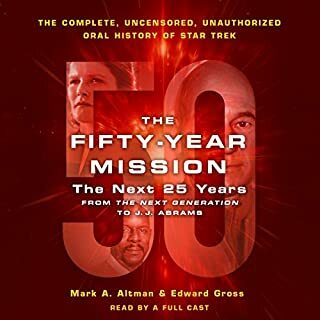 I enjoy this audiobook a great deal for all the detailed Trek trivia, but Shatner's performance feels really rushed, like he just wants to get the thing on tape and go home. I also wish they had "abridged" out the first hour which seems to focus on completely non-essential stuff, like a long boring narrative about Shatner driving across country to see his kids. I kept waiting for him to get to the, ya know, movie memories. Shatner in his typical way moves quickly through all the movies except the dreadful #5, helping us understand why it really shouldn't have been the bomb it was. Overall the stories, though extremely brief were nice and it is always enjoyable to learn a bit more about the cast. Yes, to my trekker friends. Being a trekker I found it very pleasant to listen about all Star Trek movies behind the scenes stories. It's funny, and it's entertaining. It's for trekkers though. I just think Bill Shatner's reading was like "I should finish this reading as soon as possible". I don't feel he's put his soul in it. Besides that, I've enjoyed. great read . funny and very interesting . highly recommend. gives insight to the workings of star trek . More trek stories. Again some insightful memories. From all original cast and all seven movies. From Trek the motion picture up generations.